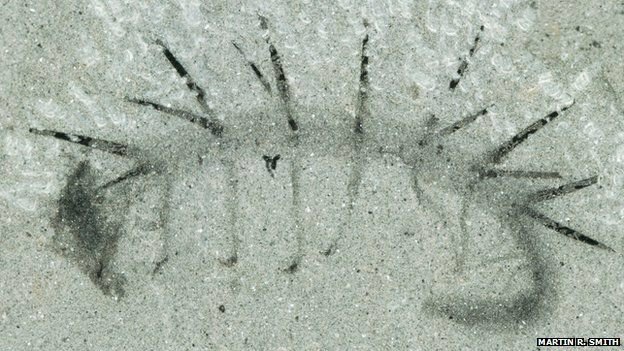 Hallucigenia, a bizarre spiny worm that lived 500 million years ago, has baffled scientists for years. Until now, its' face was a mystery. A paper in Nature reveals that new analysis has deciphered the shape and size of its' previously mysterious head. Although small, around 2 cm in length, the creature had spindly legs on its upper and lower body. The newly discovered face is spoon-shaped with a semi-circular smile underneath it. Hallucigenia was a member of the Cambrian period in the earth's history, in which various species began to form out of the primordial soup. Dr. Martin Smith, of the University of Cambridge says, "It looks completely surreal. It is like something from another world."